“It is for that reason that he loves tutoring; “when kids come to Andson with their homework thinking that the work is either boring or dumb (which is many}, and tutors can help the student understand and even begin to enjoy simple subjects such as math, reading or writing”. The Piggy Bank program sees hundreds of amazing students every week, each making an impression on the tellers who work with them. For January, Andson is highlighting future Harvard medical student Christian Anakwa. He is a fifth grader at Walter Bracken Elementary, and uses the Piggy Bank to save money for college. He has learned how to create a budget, spend wisely, and how to withdraw money from banks. Twice a year, we issue a survey to the students and parents we serve at libraries with our Academics free tutoring program. This time around, student responses to the question “What is your favorite thing about coming to tutoring?” at Rainbow Library had a common theme. With those only being a handful of shining reviews for Ms. Angela Kabiling, we not only took notice but decided to sit down with her and ask her a few questions. Her charisma and obvious love for what she does made it clear why she is so beloved by students. Angela was born in Olongapo City, Philippines as the 2nd of her parents’ 3 daughters, but has been in Las Vegas for 17 years now. She has obtained two Bachelor’s in Accounting and Economics from the University of Nevada, Las Vegas and has been working for Andson for 3 years and 7 months. Part of what makes Angela such an effective tutor is her ability to relate to students, which she does through references to memes and social media. “[She loves] making connections to social media with mathematical problems. It makes homework more relevant and [creates] entertaining situations. Seeing the light bulb above their heads and watching their gears work makes [her] proud that they’re utilizing their critical thinking skills.” But more important to Angela is the trust the children have in both her and themselves. When she’s not tutoring for Andson or working in our Piggy Banks, she enjoys gardening, playing video games, improving her culinary skills, spending time with her friends, and traveling whenever she can. Lately, she has been planning road trips to all of the country’s National Parks. Most recently, she visited Cathedral Rock and Great Basin National Park. She also has an impressive menagerie of pets, with 7 chickens (Beignet, Brioche, Baguette, Biscotti, Tiramisu, Sesame, and Pistachio), 2 rats (Ratnor and Ribbon) and a salamander (Lucio). Here at Andson, we are rethinking the idea of grants and programs. Especially those that put our team in that annual cycle of applying, hoping, and only then providing services. We don't believe that this model year-over-year can equal continued success. Firstly, we don’t believe the intent of funders is to stifle or stop any well-performing NPO from continuing much needed programming. Why would a donor or grantor want to pay for a needed service one year and not the next? Funds are truly limited, and applications are ever-increasing. The idea of capacity building is often the intent, however. Funders don’t always say it this way - as the majority of grants do prioritize collaboration and partnership - but they don’t always call for capacity specifically. When in fact that may be what they are seeking. So, we are rethinking collaborations here at Andson. When we pilot a program - it will now be with the intent to turn it into a turnkey model, curriculum, or strategy that can be run by any agency, internally. We will strive to achieve this within 1-2 operating years moving forward. It’s taken some time to get here. Truthfully, we wouldn’t have been able to think this way in 2010. We had to build the internal structure and our own capacities (along with data collection methodologies and many times the software) to make this happen. Secondly, we are defining national partnerships. When we started Andson, It was to implement change for Nevada communities. Our founder Sonia Anderson believes that what we have to offer is best implemented at home first with our own team working within the community. In the last few years, however, we have continued to develop partnerships throughout the nation. We will continue to grow those relationships, bringing more eyes back on Nevada as a leader in defining tough topics like financial education for students as early as elementary school. So, what’s going to change? Maybe not much externally - we will continue academic and financial literacy programming. But simultaneously we are going to ensure that stakeholders are involved and building capacity to take this on. Programs need better timelines and the “handoff” should be defined up front. It’s what’s right for our amazing stakeholders, so it’s right for Andson. At a time when big hair, leg warmers, and boom boxes were all the rage, parents were giving birth to now 30-somethings who would apparently not get enough nurturing in finances. This cohort of the millennial generation is pacing for a rough life with little hope of enough savings to support a retirement 40 years from now. The details in this new report titled "The Lost Generation?" and released by the Federal Reserve Bank of St. Louis, is a modern-day version of The Great Depression with questionable hope the millennial who are suffering will recover. The report concludes that the net-worth of a family headed by parents born in the 80's is 34% less than what was expected by now. What's even more interesting is this is the only sub-group within this generation to not recover from the recession between 2010 and 2016. Other millennials did. But other generations are not off the hook. People born in the 60's and 70's also accumulated less wealth than expected, 11% and 18% respectively. While most Millennials (and most other generations, for that matter) will complain they are being paid what they're worth or making the money expected, the Federal Reserve Bank of St. Louis says income isn't the issue. It's debt, a bulk of which is sitting inside loans where the purchases don't appreciate. Think cars, think education. Unlike home-ownership, there is no equity. The equity built into a college loan sits on the front end with a graduate's ability to get a job that would otherwise be unlikely without a diploma. ENOUGH BAD NEWS, WHAT NOW? Packed into this doom and gloom is a savior - father time. This portion of the Millennial generation has time to develop a financial plan, get creative with budgeting and take up a side-hustle to reverse the damage. There's one other thing - this generation is the most educated. They'll just have to brush up on math skills if they don't want their retirement accounts to be a fraction of what they could be. First, congratulations to the graduating class of 2018! If you are hoping to continue your education either in or out of state, then you're probably trying to figure out how to pay for school or get help covering some of the costs. All the information you need is below. Grants are a form of financial aid that may not need to be repaid. They’re usually need-based and are awarded from both the Federal and State Governments. However, you can also find grants at your college or from private or nonprofit organizations. To begin the process of securing a grant from the state or federal government, you need to submit a Free Application for Federal Student Aid, or FAFSA. Scholarships are another type of financial aid that don’t need repayment. Scholarships can be merit-based, which means you may need to meet certain criteria set by the scholarship-giver. Some may ask you to show that you’re a good student; others may reward scholarships based on athletic abilities or good deeds like volunteer work. You can find scholarships from all kinds of organizations. High school counselors are great resources for scholarship information. Federal student loans are backed by the U.S. Department of Education, with limits on how much a student can borrow. To qualify for these loans, you must submit the FAFSA in time for the eligible school year. Some federal loans require students to show financial need to qualify, while others don’t. With federal student loans, you have flexibility when it comes time to repay them, including arrangements based on your income. Work-study programs are offered at many schools. These programs may help you pay for school through community service work and work related to your course of study. Work-study also requires that your employer be considerate of your class schedule when assigning hours. Students who demonstrate financial need can qualify to work either on campus or off (at a participating organization). These programs are usually on a first-come, first-served basis, so be sure to contact your school’s financial aid office early to apply. Private student loans can be a useful way to bridge the gap between other forms of financial aid and the total cost of attending college. However, it’s important to be selective when choosing a private student loan to ensure you find the best rate with features that meet your individual needs. Private student loans are a great way to supplement any gap you have after exploring federal loans and scholarships. Lastly, congratulations to the more than 3,000 students who collected their diplomas, moved their cap tassels from one side to the other, and officially graduated from UNLV on Saturday! Stay tuned for our next blog about how to pay off your student debt. Here's the part that's comforting: nearly half of all Americans carry credit card debt. In fact, the average household owes about $6,000 according to CNBC. So how is it we rack up all of this debt? As it turns out, it's those interest rates that will get you and gouge you. Just how costly is it? Personal finance site NerdWallet crunched the numbers and determined the interest costs of paying off debt. It assumed credit card debt of $6,081 and an interest rate of 14.99 percent. Essentially, you want to pay off the balance in full every month. That's not always doable, especially if you've needed to use the card for a costly emergency. However, even tacking on $50 to $100 extra per month will chip away at the balance. The sooner you begin paying off your credit card debt, the better. Carrying a balance not only grows interest, it also has a negative impact on your credit score. Avoid throwing away money on interest; your bank account (and your credit score) will thank you. Don’t spend 14 years in the red - start paying that debt off today! This is for you, kids! No one is saying you have to work a 9 to 5 on your summer break from school. But, if you're getting to the age where your sole income from your weekly allowance just isn't cutting it anymore, it's time to get creative. We've helped you out by compiling this list of potential summer jobs that could earn you some decent coin. Surely there's a project around the house that dad started, but never finished. Ask if you can lend a hand. Or, find some other odd jobs at home like cleaning or organizing the garage, basement, or attic. You get the idea... think of other areas where you can help out. Maybe you have a neighbor whose yard could use a good spring clean-up? Offer to mow lawns (if you live in a neighborhood that still has grass). Maybe there are some weeds that need pulling? Or, maybe they have other odd jobs that need attention. Make flyers and drop them off at houses in your neighborhood. Make sure you're legally old enough and Red Cross trained. When you are, there are plenty of parents looking for a qualified sitter. Fido always needs a friend. Offer to watch, walk or play with dogs. There are apps that allow people to do this now, but you can easily bypass that with a few door-knocks and some ingenuity. All those items that are collecting dust in your home can turn into another person's treasure. Set up a rummage or yard sale. Used toys and clothes for kids can be hot commodities. Make sure you talk this out with your parents first. Las Vegas Valley residents rank among the bottom of the nation for debt ratios, financial literacy, and money management skills, according to new data. In a recent report released by personal finance website WalletHub, Las Vegas and its neighboring cities (Henderson and North Las Vegas) all rank near the bottom out of 2,572 cities in terms of debt ratios, credit scores, and financial management skills in the U.S. Residents were found to have mortgage-to-income ratios upwards of 400%, an average of 4 late payments, and median credit scores ranging from 632 (North Las Vegas) to 646 (Las Vegas) to 684 (Henderson). These bottom of the barrel scores indicate a serious problem in the Valley’s financial education system. More importantly, they indicate a lack of financial education in a state which already ranks at the bottom for education (in fact, WalletHub ranks Nevada as the 7th least educated state) in general. When we look on a more narrow scope, the state of Nevada is ranked 50th out of 51 states overall in terms of financial literacy. What must be looked at now is what can be done to improve the financial literacy of our community. Andson is making great strides in the effort to empower through education with our Andson Money, Andson Academics, and Piggy Bank programs. 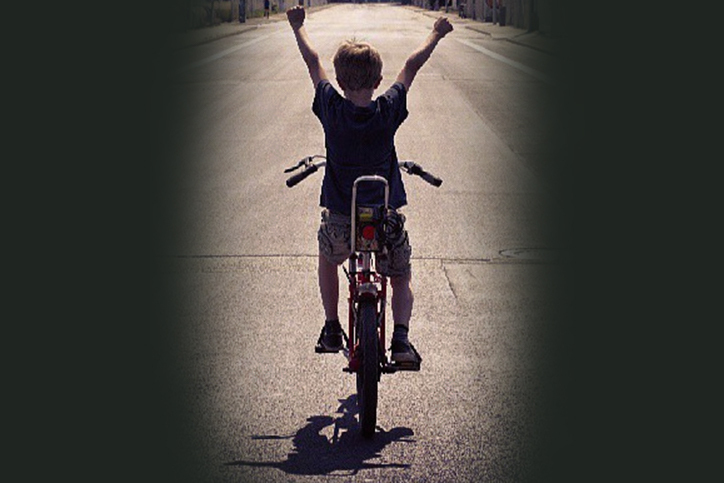 We serve thousands of students (68,000 since our start) across Clark County and find proven results from our work. Still, the fact remains that there is much work to be done to educate and better our community in a lasting way. It is thanks to our donors and community partners that we have achieved our success so far, and we look eagerly toward a better, more financially-literate future. If you’re just forking over an allowance to your kids once a week or every two weeks, then they understand the “income” part of money. But how to manage that money is an entirely different beast. 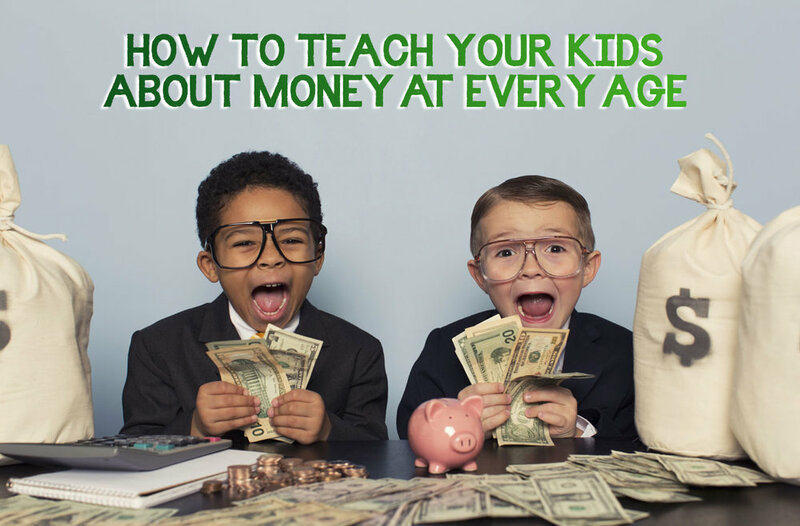 Financial guru Dave Ramsey suggests tips for parents but conveniently breaks it down by age group to make sure the information is retained and relevant. 1. Use a clear jar to save. The piggy bank is a great idea, but it doesn’t give kids any visual. When you use a clear jar, they see the money growing. Yesterday, they had a dollar bill and five dimes. Today, they have a dollar bill, five dimes and a quarter! Talk through this with them and make a big deal about it! 2. Set an example. Little eyes are watching you. If you’re slapping down plastic every time you go out to dinner or to the grocery store, they will eventually notice. If, at the end of every month, you and your spouse are arguing about money, they’ll notice. Set a healthy example for them, and they’ll be much more likely to follow it when they get older. 3. Show them that stuff costs money. You’ve got to do more than just say, “That pack of toy cars costs $5, son.” Help them grab a few dollars out of the jar, take it with them to the store, and physically hand the money to the cashier. This simple action will do more than just a five-minute lecture. 4. Show opportunity cost. That’s just another way of saying, “If you buy this video game, then you won’t have the money to buy that pair of shoes.” At this age, your kids should be able to weigh decisions and realize that each decision has a consequence. 5. Give commissions, not allowances. Don’t just give your kids money for breathing. Pay them commissions based on chores they do around the house like taking out the trash, cleaning their room, or mowing the grass. This will help them understand that money is earned—it’s not just given to them. 6. Stress the importance of giving. Once they start making a little money, be sure you teach them about giving. They can pick a church, a charity or even someone they know who needs a little help. Eventually, they’ll see how giving doesn’t just affect the people they give to, it affects the giver as well. 7. Give them the responsibility of a bank account. By the time your kid is a teenager, you should be able to set them up with a simple bank account if you’ve been doing some of the above all along. This takes money management to the next level, and it will prepare them for (hopefully) managing a much heftier account balance when they get older. 8. “Help” them find a job. Teenagers have plenty of free time—fall break, summer break, winter break, spring break. If your teen needs money (and what teen doesn’t need money? ), then help them find a job. Who knew that working was a great way to make money? 9. Teach them the danger of credit cards. As soon as your kid turns 18, they will get hounded by credit card salesmen—especially once they’re in college. If you haven’t taught them why debt is a bad idea, they’ll become another credit card victim. 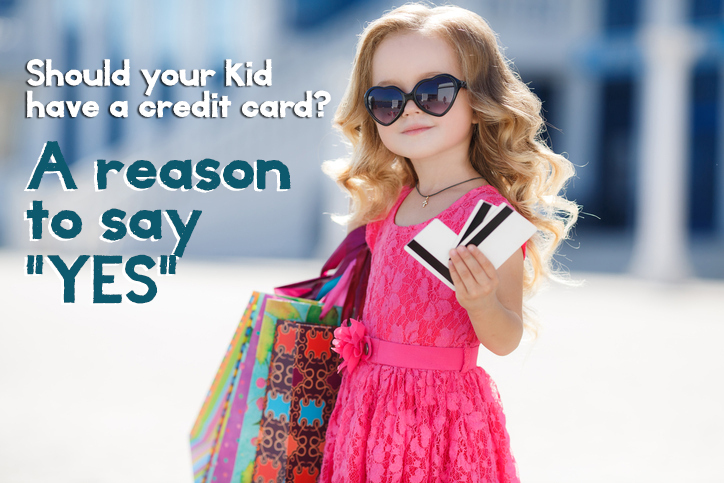 Should your kid have a credit card? A reason to say "YES"
Sure, your 16-year-old is probably not going to be buying a house or a car tomorrow, but when that time comes, wouldn't it be great if he or she had a stellar credit score? Parents: while that may be the best reason to consider adding your kid's name to your account, it should also come with an explicit set of rules. 1. The card is used for emergencies, such as car repairs or educationally related purchases. 2. The minimum amount or more must be paid on time. 3. A job must be maintained in order to pay for the purchases. The average credit score in America is 695, but the highest possible FICO (credit scoring service) score is 850. So, there's room for improvement among our nation's citizens and improvement comes with knowledge. Another reason to consider adding your kid to your credit card account is that it opens the door to begin the ongoing financial literacy conversation. They should know the ways a negative or poor credit score could impact their future lives. Rejection from potential landlords and even failed background checks due to credit are both possibilities. Even wireless carriers may be reluctant to offer better plans and contracts to those with credit blemishes. 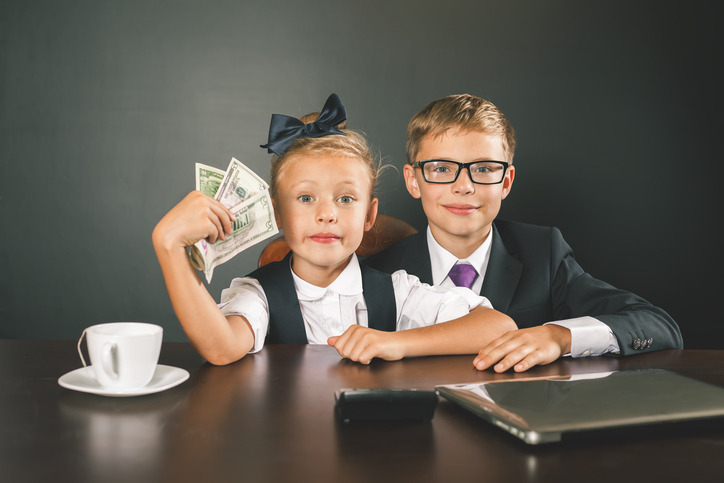 The more kids learn about the value of money and the pitfalls of bad credit, the better choices they'll make in adulthood. When the odds are one in a million, Karen Hipsher always strives to be the one. As a mom of three, she never stops inspiring. She kicks off her long days as a second grade teacher, cultivating the young minds of the next generation. Karen then hops in her car, and heads to Sunrise Library to help Andson students with their homework. She rounds out the night caring for her three sons, Denny, Alex and Charlie. While a day this tiring may weigh many of us down, it energizes Karen. She says being surrounded by kids is her favorite part of tutoring, especially when they grasp a concept and light up like a bulb. Even when students don’t understand a new topic right away, she is reassuring, reminding students to persevere, always. When Karen isn’t teaching, she is probably off somewhere learning. One of her favorite activities is picking up a good book. In fact, reading and math are Karen’s favorite subjects. Don’t let her studious life fool you, she occasionally steps away from the classroom. When Karen needs a quick rejuvenation, the beach is the perfect place to recharge. The sand between her toes is Karen’s ideal pick-me-up. But when the beach isn’t attainable, she opts for cuddles with her cupcake of a rottweiler, Cheyenne. Karen Hipsher has been a tutor with Andson for 6 years. To learn more about the tutoring program, and where services are offered, click here. LaChel and her six children visit Rainbow Library three days a week for Andson Academics homework help sessions. Some of her children have special needs, yet all six have seen significant improvements in their grades, especially in reading and writing. One of LaChel’s sons, Brendan, told us that through tutoring he has learned to love reading. His favorite subject is History and he loves reading stories about historical events. Homework help is free for students and families and without Andson Academics, LaChel could not afford the quality help her children need and deserve. We could not do this life changing work without our wonderful CCSD licensed tutors and our partners at LVCCLD. If you know a child in need of homework help, see the library schedule HERE! We are still looking for a few teachers to join us this year. See below how you can join our St. Jude’s Ranch team as a part-time tutor. To watch videos in the Andson ASKS series, click HERE. We’re just days into 2018, and if you’ve already spent your monthly allowance on lattes, don’t freak out just yet. There are plenty of other ways to get back on track and stick to your financial New Year’s resolution. 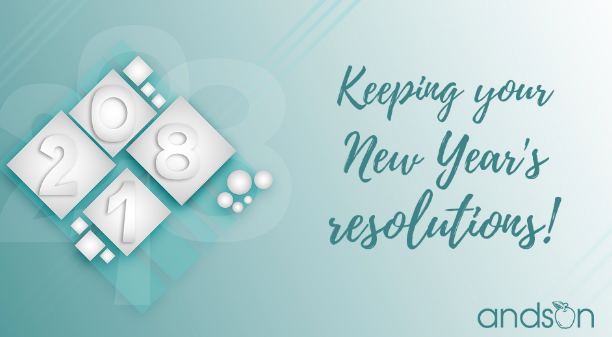 To make your resolution stick, you need to start by setting a goal and planning how to achieve it. If you want to reel in your debt, write down a solid plan. Instead of just saying you will pay off your credit card, plan to put $100 a month towards your card every paycheck. By writing specific goals, you set an expectation for yourself and can monitor your personal progress. According to the University of Scranton, it’s estimated only 8% of people reach their New Year’s resolutions. If you fear you’ll fall into the other 92 percentile, there are small ways you can set yourself up for success. Instead of thinking of your goals as a resolution, start to think of them as lifestyle choices. Let’s go back to the credit card example: instead of saying your resolution is to pay off your credit card, decide you will now live within your means. If you decide to stop using your credit card as a lifestyle choice, the debt won’t continue to rise, and you will be able to pay it off slowly with your extra funds. Make sure your new lifestyle choices are SMART: specific, measurable, attainable, realistic and time-sensitive. If your goals are too broad, you won’t be able to measure your progress. It’s important to track your progress, because it’s the only way to tell if you are truly succeeding or just following a plan that will lead nowhere. You also need to be realistic. We can’t all become millionaires in just one year, but we can start taking classes that will lead to a higher paying career or save $20 more a week to pad our emergency funds. Lastly, make sure you put a completion date on your goal. If you want to get a new job, set a specific time frame. For example, you want a new job by June, or you want to save $1,000 before your next big holiday. Every lifestyle change, no matter how big or small, is tough. Make sure you have a support system to help you stick to your plan. Talk to your family, friends, and even co-workers to set up a network of supporters who will keep you on track for 2018! It’s that time of year again - winter vacation. Thankfully for us the weather outside isn’t too frightful, but let’s be honest, trying to keep the kids occupied for two weeks is intimidating enough to give Frosty the shivers. Like Rudolph, Andson is here to guide you through the holiday happenings, so you and your children stay merry and bright. The mountains are just a hop, skip and a jump away - If you’re dreaming of a white Christmas, you must head over to Mount Charleston. They’ve had a relatively dry season so far, but even without fresh snow, the mountains are still magical in the winter. It’s nearly 20 degrees cooler than the Valley, so you finally have a reason to break in that winter coat. Even if you can’t go sledding yet, there are still multiple hiking trails you can explore. Once your cool adventure is over, you can warm up with a cup of hot chocolate at the Lodge. Goodwill is calling, answer - If those new toys and clothes have made your house feel stuffy, you can get your spring cleaning done a season early, while teaching your children about the season of giving. If they received new toys, have them find some old toys they don’t play with anymore. Likewise with old clothing. Put all the donations in a box or bag, and bring it down to your closest thrift shop. Your children will learn the true meaning of the season, and you’ll have a little elf to help you de-clutter. Libraries aren’t just for reading anymore - It’s no secret Andson loves the Las Vegas Clark County Library District. If you haven’t checked out their services yet, put that at the top of your New Year’s resolutions. Each branch offers a range of activities, from karaoke, to stem learning, to crafts, and even puppet shows! Of course there are plenty of books to be read too. The library is a place to make memories with your whole family, just remember to use your indoor voice! Swimming is so this season - Swimming in the brutal Vegas summer is a no-brainer, but swimming in the winter? That’s a story to tell. The Las Vegas Parks and Recreation offers a swimming pool that’s open year-round. If you have a mermaid or merman in your life, this is the perfect winter vacation. They’ll get to work out all their energy in the pool, and their friends will think they’re brave for bracing the frigid temps. As you’ve probably guessed, this pool is indoors so it’s are totally safe. The Pavilion Center pool is located at 101 South Pavilion Center Drive. It’s open to all ages Monday through Friday from 7am to 2:30pm. It will be closed now through Christmas, but it will reopen on December 26. It will also be closed for the New Years Holiday. Prices range from $2 to $3. Let’s get competitive - Getting children to pay attention to one task for more than an hour is daunting, but there’s nothing like a friendly competition to spark their interest. If your children are already tired of all the board games in your closet, challenge them to make a game of their own. Have them use their own toys to create characters, and allow them to make up their own rules. Once they have created a game, gather the whole family and play. The family time will bring everyone closer, and will make your children feel accomplished -- especially if they win at their own game. Preparing for college can be considered an adventure in it’s own right. With the itch of graduation still lurking in a not-so-distant past, the weeks ahead of move in day are daunting. The exhilaration of moving to a new city and creating a new life is matched by a fear of what is being left behind – family, friends, moments once so cherished, that are now just memories. With his freshman year at the University of California, San Diego within reach, 18-year-old Andre Salehian felt a deep urge to seek one last hurrah before moving into adulthood. Las Vegas is an adventurous city, but he desired more than just a night aimlessly wandering downtown. After countless hours of research and an extensive amount of pleading with his mom, Andre decided to spend his last summer as far away from the bright lights as possible. Just 6 hours before his greatest adventure was set to begin, the butterflies in Andre’s stomach fluttered him awake. He will be the first person to admit packing is not his strong suit. The clock subtly ticked in the background; with each second, he checked another item off the list: Clothes, check. Toothpaste, check. Passport photos… passport photos… and then it hit him, with just hours before the biggest trip of his life, Andre was missing one of the most crucial elements from his suitcase. He already had a passport, but Andre needed the photos to complete volunteer work. Without them, He would be left behind. Thankfully, a 24-hour town has its perks. A quick stop at Walgreens, and his bags were finally packed. Passport photos, check. 24 hours, three continents and an uncomfortable nap later, and Andre was finally in Tanzania. This trip was booked through Global Leadership Adventures, also known as GLA. The program helps teens and college students experience the world, while giving back to the communities they explore. So, from day one, Andre’s main priority wasn’t indulging in excursions, although there were plenty to be had, instead, the teen stepped off the plane and immediately went to work. With three other English speakers by his side, Andre engaged local children in learning activities. He taught 10 year old Swahili-speaking students English concepts like emotions, future, and time. Breaking down the language barrier wasn’t an easy feat, but after days of connecting with nearly 15 children, Andre created emotional bonds that were deeper than the two languages could describe. Even today, months after Andre left the country, the children are still engraved in his daily thoughts. Andre’s service at the school was not limited to teaching within the classroom. Each day, after cultivating the young minds, he and his fellow GLA volunteers would tighten up their bootstraps to beautify the school. The group painted classrooms, fixed wobbly desks and worked on landscaping. Before Andre left the school, he and his fellow volunteers left their permanent mark by creating a garden for the students. Andre’s hard work will have a lasting impact, by providing a bountiful feast of fruits and vegetables for years to come. After the work was done, Andre was finally able to play. He roamed across Tanzania, visiting a local tribe, encountering exotic animals and hiking the base of Mount Kilimanjaro. Andre’s visit with the Maasai Tribe was his first African experience away from the comfort of the school. He was astonished by the dry, dusty lands, which made the Vegas desert appear nearly tropical. Goats roam across the East African Rift, and are used as the primary food source of the Maasai people. The students were aghast after goats they petted just moments before, were slaughtered as a welcome dinner. 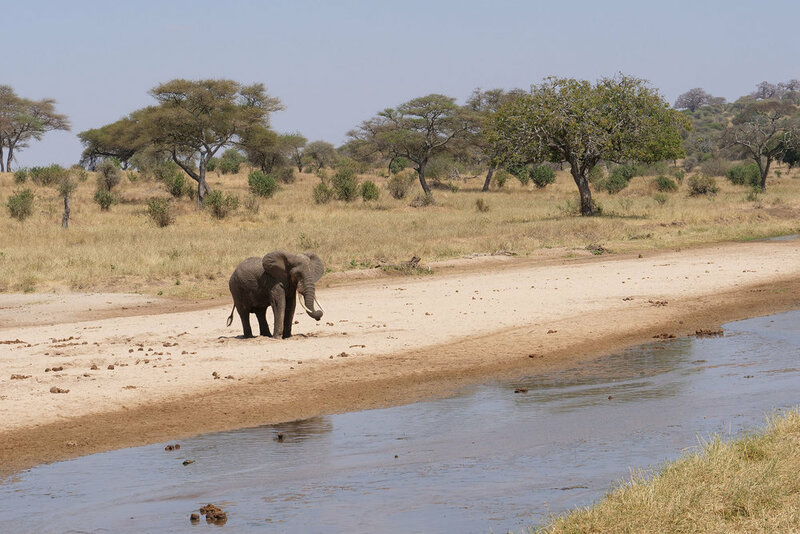 During Andre’s three weeks abroad, he was bewildered by the contrasting cultures within Tanzania itself, but also the stark similarities between the country and his own home in the United States. He was able to travel to a middle-class area of the country, where residents had cell phones, businesses, and vehicles of their own. Andre admits he expected the country to be in a much worse state, and while there is still rampant poverty, Andre was surprised by the vibrance that gleams out of Tanzania. With photos of his extraordinary summer in hand, Andre is now prepared for his upcoming adventure. The wistful memories of high school are now a lifetime behind him. Three weeks is not long, but the experience changed him, matured him; it prepared Andre for imminent challenges adulthood will bring. Andre Salehian joined the Andson team at just 15 years old, as a bright eyed summer intern who wanted to make a difference in our community. He is a talented videographer and graphic designer, whose expertise grew exponentially during his three years with us. He was a star amongst his peers at West Career & Technical Academy. His superb academic and personal achievements landed him at spot at the University of California, San Diego. We are so proud of all his accomplishments, and can’t wait to see how he continues to grow throughout his college career. Shout out to Super Star Tutor Aide, Zoie Yell! Zoie is familiar with the Las Vegas community, being a third generation Las Vegan herself. She is passionate about Linguistics and World History. She loves studying word drifts and changes in definitions while seeing how languages have formed and changed over time. The students that Zoie tutors gain confidence in themselves and their work. She has an extraordinary way of instilling a love of learning within them. We’re honored to have such a positive role model working with our youth!